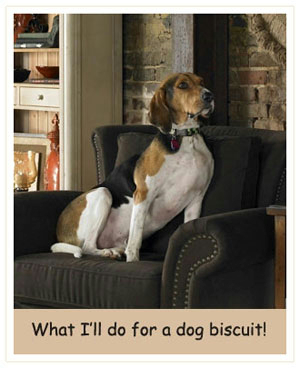 Did you know hounds make great housedogs? I think I can speak for my Walker Hound brothers and sisters when I say that we love our families,adore a good soft couch, and are particularly fond of lazing about for a good part of our day. When I was at the county shelter, I used to bark a lot. So much so that the folks there called to find me a home. That was one time when being loud paid off. All I wanted was to get out of there because now that I have my own family and know I'm safe, I don't need to bark much at all. Except when it's time to go for my daily run alongside the golf cart, I can't help it then. I'm just excited because it's one of my favorite things to do. Oh, and once in a while I like to bugle a bark at the local deer just to let them know I'm around, because chasing them would just be too much work. As for the photo shoots and publicity, it comes natural to me. Please note I don't give autographs, but welcome all fans to bring me dog biscuits.